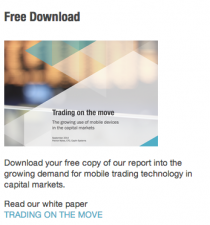 Last week, Saxo announced they had completed a spot FX trade using their new mobile trading app, whilst bungee jumping. There was much joking about the ‘rate bouncing’ after the trade etc. Their website shows more daredevil ways to trade, including Base Jump Trading, ‘The first FX trade at terminal velocity‘. Great video here and of course Saxo are fully embracing HTML.